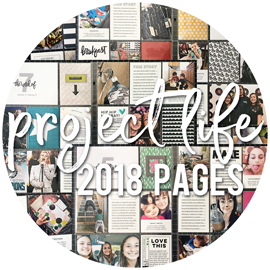 Last week, I shared the first of two layouts that I created a while back for Bella Blvd, for a special company spotlight feature at Paper Crafter's Library. That feature went up last Wednesday, and there's a giveaway that is still open, if you'd like to get in on a chance to win some of Bella's new Tiny Text alpha stickers! They'll be announcing the winner on Wednesday, this week. For my second layout, just like the first one, I used Bella’s Family Frenzy collection, along with the new Clear Cut transparencies and Tiny Text alpha stickers. The Clear Cuts come in a wide variety of colors, as well as patterns – confetti dots, chevron, stars, and hearts – that coordinate with all of Bella’s paper collections. I’m a simple girl at heart, so my favorite Clear Cuts to use, and the ones I turn to the most, are the white patterns. Bella’s new Tiny Text alpha stickers, which are 12x12 sheets, come in 10 different styles – 8 sheets that contain 5 different colors in 2 fonts, 1 sheet of all white in 2 fonts, and 1 sheet of all black in 2 fonts. These tiny alpha stickers are perfect for adding subtitles to your title work, or adding additional little details to the page. I love to create large die cut titles, and then using tiny alpha stickers to finish out my title. So these new Tiny Text alphas are perfect for that. I love that there are so many color options to choose from, and they will coordinate with any and all of Bella's colorful collections. To adhere the outline of the word "family", I ran it through my Xyron so that I would be guaranteed to have a good amount of adhesive on the entire piece. I then adhered it to the transparency "family". To adhere the transparency die cut "family" to the green die cut "family", I used some mini silver brads to secure it in three different areas. I also love that floral patterned paper for fussy cutting out the flowers to embellish my projects. I'm not a huge fan of fussy cutting, but sometimes it's well worth the few extra minutes it takes. I created two new layouts a while back for Bella Blvd, for a special company spotlight featured at Paper Crafter's Library, which went up today. Just a head's up - Bella is sponsoring a giveaway on the Paper Crafter's Library site, so you should definitely stop on by and leave a comment for a chance to win some of their new Tiny Text alpha stickers. 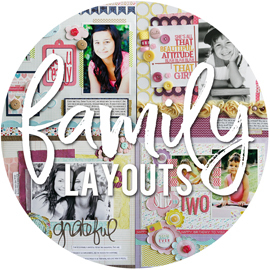 For this layout, I used the Family Frenzy collection, along with the new Clear Cuts transparencies and Tiny Text alpha stickers. Our newest patterns for the Clear Cuts are chevron, stars, and hearts, and I wanted to show all three of those on this layout. Bella is known for their great tone-on-tone patterned papers (usually found on the B sides), and they are the patterns that I turn to the most. I pulled out several patterns that coordinated with the Clear Cuts that I wanted to use. By layering the same color patterned paper and Clear Cut together, it keeps with the tone-on-tone look, and doesn’t overwhelm the page. If you haven't seen the new Tiny Text alpha stickers, you should check them out. There are 10 different sheets, with one being all white and one being all black. The other 8 sheets have a mix of colors, and each sheet contains two different fonts, with three lowercase typewriter sets and two uppercase set, along with a tiny little circle alphabet in the center of the sheet. I want to wish you all a very happy Thanksgiving tomorrow! I hope you enjoy your holiday, and time spent with family and friends. And of course, lots of turkey and mashed potatoes, which is my favorite part! 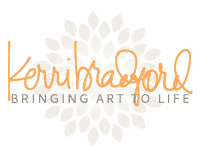 I have a new layout up at Kerri Bradford Studio today! These same photos in the same photo collage, only in black and white, will appear on another layout I'll have to share soon. I used them on a layout for Bella Blvd that had to be mailed in, and I won't be getting it back. I figured why not print out the collage again, and scrap it on a layout I can keep! Back when my oldest daughter Alyssa was a senior in high school (a year and a half ago, but it seems forever ago), I had taken her out to the almond orchards by our house to try and get some senior pictures of her. I took Sarah along with us, with the hopes that she could help get some natural smiles out of her sister. That didn't work as well as I would have liked. But I did manage to get some photos of them, together in their element - being weird and goofy! When I was pulling patterned papers for this layout and picking colors, I knew I wanted some browns and green. My mind also went to blue, as Sarah has a blue hoodie on (although only in one photo, which is weird) and her phone case was blue. I have no idea how I came up with pink, but I did. My papers are lots of older ones from Studio Calico (brown dots), Echo Park (blue diagonal stripe), and Basic Grey (pink). I used the Hearts Background kit to add the heart background to the center part of the page, cut from a subtle pink patterned paper. I had already adhered the brown dotted patterned paper strips to the sides of the page, so I sized the heart background to fit the space in the middle. It was ok that it wasn't a full 12" tall, since I cut it into two pieces to go above and below where my photo collage would be. 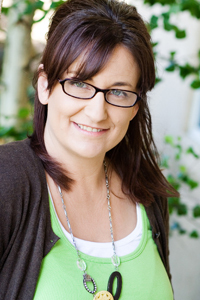 I arranged a handful of these silly photos in a collage, using Kerri's Picture That [Go Long] storyboard templates. That photo on the top row, second from the left, is a favorite of mine. I have it hanging in the house as an 18x24 photo, and I had also added a digital brush from Ali Edwards to it that reads "loving life with you by my side". I knew I wanted to use a large, brush script word for my title, and came across "adore" in the Something To Say kit. I thought it would be fun to combine it with tiny alpha stickers to read "it's your weirdness that I adore". I cut the title from both patterned paper and brown cardstock, and layered them slightly offset from each other to give a shadowed look. Of course, in true Laura fashion, I had forgot to even add the tiny alpha stickers to complete the title. I photographed the layout and everything. It wasn't until I was getting ready to send this to Kerri that I realized I had forgot to finish it. Lol. I grabbed these tiny kraft alpha stickers to add to the page, and it wasn't until I had them all laid out that I realized they weren't sticking that well. My first thought was to just add a dot of glossy accents to each one, to adhere them in place. And somewhere along the way, I didn't plan my spacing that well, and ran out of room for the "I' at the end. So it's not quite what I had in mind, but they were all stuck down and I couldn't change it. Still works, I suppose. In looking for some tiny alpha stickers, I came across these incredibly old flower die cuts from Sassafrass. They're more like punch out dies, where they were on a sheet and half attached after all these years. I guess it pays sometimes to hold onto things for years and years, because they matched the layout perfectly. I had to use them! I did a little random machine stitching around the centers of each, and added some pink enamel dots to the centers. Done and done! It's time for another "Spread It Out" feature over on the Bella Blvd blog today, which means that I have a new two page layout to share with you. I've been a home daycare provider for a little over 14 years now, and have had close to 36 kids (the 36th was actually born yesterday and will be coming here soon!) that I've taken care of throughout those years. There are actually a few more kiddos that have been in the mix, but these are my main ones. Lately, for different reasons, I've had a lot of these kids on my mind and I felt this need to do a layout focusing on all of the little ones that I've been lucky enough to spend my days with, and to have a small part in helping to raise them during their first few years of life. The amount of photos I needed worked out perfectly, since I love to line things up and collage photos together. I printed them all as 2x2" photos and they fit across the page in three rows of 12 (minus the one new baby, who I will add in when he gets here). Finding all of these photos took me forever. Which is crazy, since I did THIS FRAMED PROJECT about two years ago, and I honestly would have thought I had saved all of these photos in a folder somewhere to work from. But I hadn't. So I dug around for hours on my external hard drive, looking for photos of each of these kiddos. I arranged the photos in sets of four, so they were directly side by side and I could treat them as one "photo" when trimming them from the sheets after printing. I just had to cut some of them in half, since I had 6 kids in each row, on each page. I should have been a little more careful when trimming them, as I left a little white border along the top and bottom, and they're not all even. But they're close enough. Once I knew where on the pages I would add my rows of photos, that left me the areas to fill with patterned paper. Since I printed all of the photos in black and white, I had way more freedom in choosing my colors for the page. I decided on a black, white, navy blue, green, and yellow color combo, and set out to find patterned papers and other elements in those colors. And I have to point this out, only because I just noticed it. That navy blue 2x2" card says "selfie", and I totally thought it said "captured". My bad. Lol. I pulled patterned papers from the Daily Chevies, Lucky Stars, Fresh Market, and Whatever Is Lovely collections. I actually had more that I wanted to say on this layout. My original plan was to add my title along the top, and have journaling all across the green patterned paper along the center of the pages. Once I added my title to the center of the page, that didn't leave me with as much room for journaling, so I kept it short and sweet. I kept the rest of the spread pretty simple, since I wanted the focus to stay on the photos, with strips of patterned papers, a few border stickers, and some simple embellishments. I used a few 2x2" cards, either taken from a sheet of patterned paper on the Candid Cards that used to come with some of the collections. I did add a few enamels at the end. But other than those few things, I didn't feel the need to add anything else to the pages. And that one little spot in the bottom right corner is reserved for the new baby boy, born yesterday morning. Brother to the little girl two photos over. I'll just remove that little square of patterned paper and add in his photo later. All this week, the designers at Bella Blvd are teaming up with Kerri Bradford's designers, to bring you projects that combine Bella's colorful collections and products with Kerri's cut files. 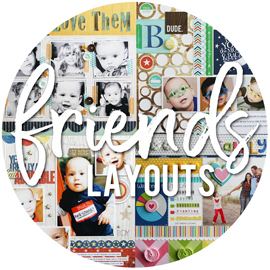 And today, it's my turn to share the layout I created over at Kerri Bradford Studio. Kerri's cut files and Bella Blvd's colorful collections pretty much go hand-in-hand for me, since I'm lucky enough to design for both teams. I've done quite a few layouts for both Kerri and Bella, featuring photos I've taken of my cousin and his family over the last few years, and I decided to scrap another set of photos of them for my team-up layout. I pulled my colors from the photos themselves, and picked out some Bella patterned papers in navy blue, yellow, green, and brown. I used the confetti patterned paper as my "neutral" paper for the side of my layout where I knew I'd have my photos and title. I usually don't die cut all of my elements from the same patterned paper, but that's just sort of how it worked out this time as I liked the navy blue woodgrain patterned paper for most of my pieces. I die cut the circle border from Kerri's Simplicities: Best Thing Ever kit to add along the left side of page, to break up the "heaviness" of too much patterned paper on the page (if that's even a thing?). Alongside the circle border strip, I added a strip of yellow chevron patterned paper, layered with a strip of white Confetti Clear Cut transparency on top. I have to say that the white Clear Cuts are my favorite to use, as they're so subtle when laid over any patterned paper or even white cardstock. To adhere the transparency in place, I cut it a little wider than needed, and added the adhesive under where the confetti patterned paper and the brown border stick were going. Then I machine stitched along the sides to secure it in place. I love the "together" tab, from the Love: Every Little Thing kit, for tucking behind photos or layers of papers. I won't lie. I often have ideas of tucking things under the edges of papers or photos, and then I often forget to do it before doing my machine stitching. Luckily it all worked out on this layout. I went with the "love at home" title from Kerri's All In The Family kit, as we took these photo at my cousin's house. We often take their photos in other locations, so I loved the idea of adding the "home" touch to the page. And to embellish the page, I die cut some of Kerri's Friday Freebies: Flower Power flowers (yes, she's got tons of freebies on her site!) 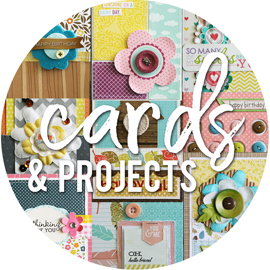 from coordinating patterned papers and added chipboard circles or enamel dots to the centers. 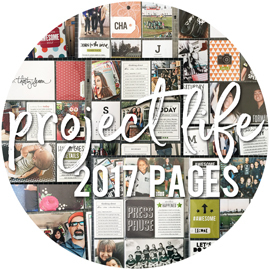 It's the first Monday of the month, which means there's a new monthly project sheet up on the Bella Blvd blog today. For this month's layout, I was asked to work with the Family Frenzy collection, the new Clear Cuts, and to incorporate a "home for the holiday" theme into my page and title. Luckily, I actually had a few photos that would work for this, so that I didn't have to make something up. Lol. The girls took these selfies of themselves when Alyssa was home from college for Thanksgiving last year. I knew they would match well, since Sarah was wearing a red sweater and there's red in the collection. I started with the "selfie" patterned paper, since these were selfies that the girls took of themselves. I printed three photos - one at 3x4, and two at 3x3 - and arranged them on a strip of the selfie patterned paper. I used the navy blue border strip from the Borders patterned paper, cut into two pieces lengthwise, and added a strip to either side of the selfie patterned paper. I did wait to adhere this entire piece until all of my other papers and Clear Cuts were in place. For the Clear Cuts, I decided to use the white hearts transparency and the green chevron transparency. I laid a strip of the white hearts over the red patterned paper along the left edge of the page. I made these strips wider than would show on the page, so that I could add the adhesive to the part of the transparency that was behind the other patterned papers. I cut the green striped patterned paper and the green chevron transparency to the same size, both of which were just a little wider than would show on the page. I added some small glue dots to only the sides of the transparency when adhering it to the page, knowing that the selfie photo strip and the yellow border along the right side of the page would cover the glue dots. I cut a larger piece of the white hearts transparency to adhere along the right side of the page. I had my green striped patterned paper pieces and the aqua "family" border strip arranged on the page, so that I knew how tall to make the transparency, adding a little bit extra so that I could hide my adhesive behind the other papers. For the title, I wanted to incorporate more of the patterned papers and more color, so I decided to hand cut letters for part of my title. I did this recently on another layout, that I haven't shared yet, and I really liked the way it looked. Of course, it takes me forever to do, and the letters never turn out quite like I want them too. But it's still fun to try. The way I went about this, because I most certainly cannot wing it and cut them freehand, is to sketch out my letters on a piece of tracing paper. I just played around with them until they looked ok, and were sort of the same size and looked good together. Then I cut those out, and traced them onto my patterned papers (I flipped the letters and traced them onto the backsides of my papers for most of these), and then cut out the final letters. I did add a dot to my "i" here, but that was after I had taken my photos. Kind of an afterthought on my part. Once the patterned papers and transparencies were in place on either side of the page, I adhered my strip of photos/patterned paper in place. Then I went in and did lots of machine stitching, which also helps "adhere" the transparencies in place. I fussy cut some of the flowers from one of the patterned papers, and used them to embellish the page, adding white enamel dots to the centers of some of them. Since I had added some black pen lines around my title letters, to help them stand out, I did the same to the fussy cut flowers, just to tie them in a bit more. You can download the November project sheet, complete with full supply list and detailed instructions, RIGHT HERE.